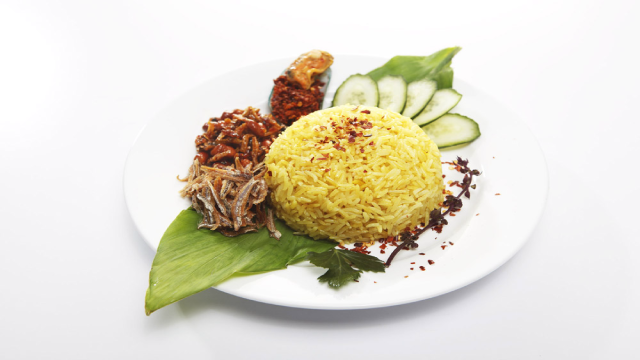 This is a Malaysian staple favourite and is undoubtedly a must-eat and must-savour dish! Wash and soak rice with sufficient water to cover and leave to soak for 10 minutes. Drain and mix in rice seasonings. Pre-heat rice cooker. Put knotted pandan leaves and 1 tablespoons of vegetable oil into the inner pot; cook for approximately 2 to 3 minutes until fragrant. Add in seasoned rice stir mix thoroughly. Add in hot water, to cover rice. Close the lid of the rice cooker. Turn on the rice cooker and wait for it to cook automatically. When cooking process finished, open the lid and stir the rice to loosen. Serve Turmeric nasi on a serving platter, with fried ikan bilis, deep fried peanuts, fried eggs, cucumber slices and McCormick sambal chilli.